Bavarian Rococo sculptor. He studied tan years at the Academy in Vienna with Georg Raphael Donner. From 1737 court sculptor in Munich. Beside Egid Quirin Asam he was the leading sculptor of the South-German Rococo. His works include the high altar, St Michael s church, Berg-am-Laim, Munich, and altars in the monastic churches of Ettal and Schäftlarn. Gnther was his pupil. 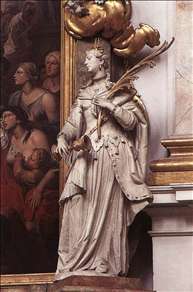 See more details about "St Barbara"